Tired of feeling gouged at the pump? Do you drive a gas guzzler, or maybe you just wanna save some money on gas? SmartFuel is a new subscription based iPhone app that gives you access to the cheapest prices for gas stations in your area. With SmartFuel you’ll be able to find the best prices for the cheapest gas in a hurry. Just open the app, and hit the Find Near Me button. SmartFuel will search and show you a list of stations within a specifiable radius. The idea of having to pay for a service up-front to save money might not draw too many customers. That’s why the SmartFuel app will give you a 30 day free trial of the service once you’ve downloaded the app. SmartFuel licences its fuel price data from OPIS (the Oil Price Information Service) which get their data from credit card swipes. So you’re likely to get the most accurate data. This licensing fee also means you’ll have to pay for using the SmartFuel service. Although the app is free to download and try out for 30 days, you’ll have to pay a subscription fee to use the service. The pricing is currently $4.99 for 6 months, $8.99 for one year or $14.99 for two years. SmartFuel is actually pretty smart, both in the way the app looks and works behind the scenes. Innitially you pick the type of car you drive and the grade of gas you’re looking for. Pick a radius to search for and add destinations to use as bookmarks in the future easily from your iPhone Contacts or by typing in an address. 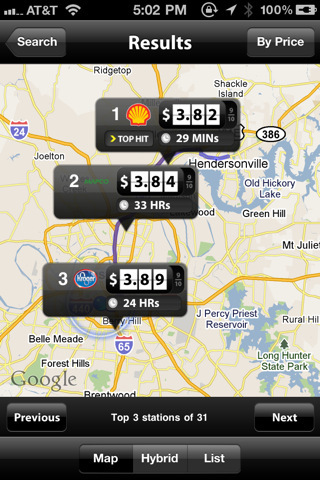 The app then looks up the latest gas prices and shows you the results in a modifiable list. You can choose to view the results sorted by lowest price, or closest distance to you. The station list can be shown on a map, as a list, or a hybrid view that combines both. Gas prices are denoted by large legible text via ticker box design, along with a green amount for the dollar amount you’ll save by using the station. For example if you have a 20 gallon gas tank and SmartFuel locates a station that sells your fuel for $3.77/gallon instead of $4.59/gallon, you’ll save 82c per gallon for a total of $13.94 on a tank fill-up. This maths does assume the highest gas price in your area as the alternative, and requires an empty tank to be filled. Once you’ve found a station you can get directions to it by hitting the blue directions button. SmartFuel doesn’t provide step-by-step directions, so you’ll have to pinch the inline map to zoom in/out on your route, if you’re not already familiar with the station. You can also see the time elapsed since the last price refresh at any station, along with a safety and cleanliness rating, phone number and distance from you. There is a color coding that goes from green to orange to red to denote the price aging in the SmartFuel app. Once a price gets older than 48 hours, SmartFuel labels it with an expired tag to warn you. The price for any gas station is locked at the fuel grade you pick to start, and unfortunately can’t be changed to view other grades available at the station. You can report inaccurate pricing or incorrect details via the SmartFuel app if you find errors when you arrive. The other smart part about SmartFuel is how it calculates your savings. You have to record your purchases each time you buy gas in the app by hitting the Record Purchase button. Once you get 5 of those transactions entered, SmartFuel figures out your projected savings going forward based on your purchase trends and fuel consumption. When recording a purchase you can enter your Gallons purchased, correct the price per gallon if need be and rate the gas station on a 5 star scale. Over time you’ll be able to go to the Savings tab in SmartFuel and earn points that you can use towards rewards in upcoming versions of SmartFuel. Personally, I’d prefer to find a median between savings, convenience, and quality. Driving 50 miles to save $10 on gas might not be the best option if it means I’ll waste an extra hour and an extra gallon of gas. So having an option in the app to limit the brands or preferred stations would make the app more valuable to me. 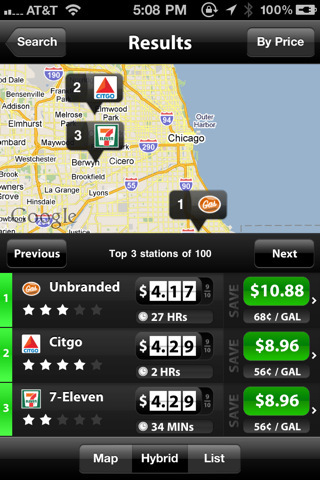 The SmartFuel app doesn’t currently have a way to bookmark your favorite stations or gas brands but it is coming soon. The developers are also working on adding an interactive route map for directions. As for the paid plans, I would think that if you are driving long distances and or paying a ton of money on a gas hog, these fees would be offset by your savings very quickly. I still would love to see an ad supported version of the app that would subsidize part or all of those fees. Having heard about the new iOS 5 location based reminders feature, it would be really nice if the app was able to send me a push notification when a preferred station in my route had a price drop. Finally, perhaps even adding a feature that lets you export detailed gas expenditures would serve beneficial to businesses. 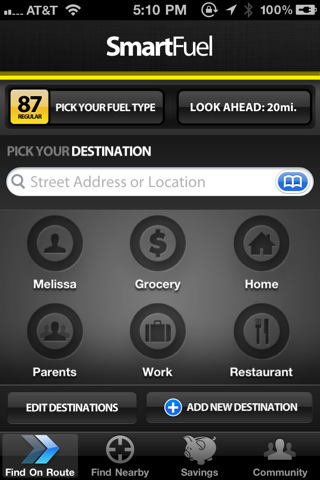 AppSafari review of SmartFuel was written by Joe Seifi on June 16th, 2011 and categorized under App Store, Auto, Featured, Shopping. Page viewed 6177 times, 2 so far today. Need help on using these apps? Please read the Help Page. Hi there! My name is Kaley and I’m a SmartFuel employee. First, I’d like to thank the reviewer so much for the suggestions, we will definitely take them into consideration. Some of the suggestions are actually already in the works for the next version! If anyone else has suggestions we’d love to hear them. Just wanted to clarify, there are step by step directions currently in the app. When you hit the “directions” button it takes you to a screen with a map you can then hit “start” at the upper right hand corner and the app will take you through step-by-step directions. Another thing I’d like to mention is the functionality of actually searching along your route. SmartFuel can do a radius search around your current or bookmarked locations but it can also find gas between your current location and a destination. The app searches 1 mile off of the route to find the cheapest gas without sending you far out of your way. The gas may be cheaper 50 miles away, but we understand that may not be the most convenient or even cost effective solution. Thank you again for taking the time to review SmartFuel! I tried the SmartFuel APP on my Iphone for thirty days and was impressed with how user friendly it was but when I paid my membership for the full service nothing happened. On my phone I get an error message stating “no network connection please check”. When I tried to get a refund for the monies that were spent nothing on that end either. I have learned to stick with the freebies from now on.